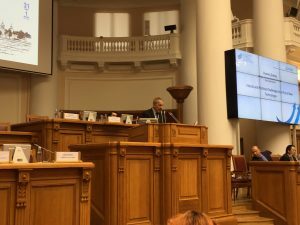 Dr Evgeny Roshchin, Dean of the Faculty of Comparative Political Research at RANEPA St Petersburg, introduces the speakers. 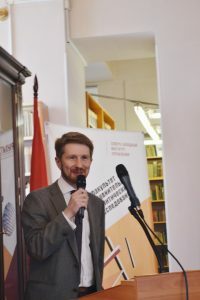 On 31st May and 1st June, Dr David Lewis and Dr Catherine Owen organised and presented at an international round table entitled ‘Eurasian Integration and Public Administration’ as part of the annual Forum on Public Administration organised by the St Petersburg branch of the Russian Presidential Academy of National Economy and Public Administration (RANEPA). The event was funded through an Impact Award and was hosted by RANEPA’s Faculty of Comparative Political Studies where Catherine Owen is currently a Visiting Fellow. The Faculty Dean, Dr Evgeny Roshchin, chaired the session, which was held in Russian. Left to right: Renata Abdullina, Prof Yang Cheng, Dr David Lewis, Saniya Sagnaeva, Dr Catherine Owen and Dr Igor Savin. Alongside presentations from David Lewis and Catherine Owen, attendees heard speeches from Professor Yang Cheng from the Shanghai International Studies University, Dr Igor Savin from the Institute of Oriental Studies of the Russian Academy of Sciences, Saniya Sagnaeva, an independent ethnographer based in Uralsk, Kazakhstan, and Renata Abdulina, the St Petersburg Governmental Chair of the Committee for Youth Policy and Relations with Public Organizations. The round table aimed to foster dialogue between scholars and policy-makers on the subject of Eurasian integration, and was attended by local politicians, scholars and students interested in the politics of Eurasian integration. 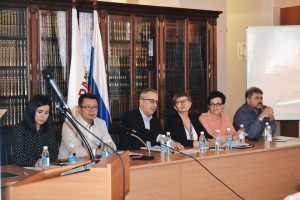 The round table constituted an interdisciplinary dialogue on processes of Eurasian integration as the speakers presented conclusions derived from macro-political analyses, qualitative content analysis and anthropological methodologies. Speakers discussed numerous political factors associated with the various integrative projects advanced in the region by Russia and China, as well as the way these projects are perceived and experienced by ordinary people, especially along the border areas. Follow-up questions from the audience focussed on the aims and goals of China’s Belt and Road Initiative (BRI) and the extent to which policy-makers in the UK take on board research and recommendations from scholars working on these subjects. On 1st June, Dr David Lewis gave a keynote speech at the Forum’s plenary session, held at the historic Tauride Palace. Built for noted 18th Century statesman, Prince Grigory Potemkin, the palace briefly housed both the Russian Provisional Government and the Petrograd Soviet in the aftermath of the February Revolution of 1917. The event was attended by regional officials, policy-makers and academics, including the Chief Federal Inspector for St. Petersburg, Russian Presidential Plenipotentiary of the North-West Federal District and the General Secretary of the Interparliamentary Council of the Commonwealth of Independent States. The two days provided an excellent opportunity for scholars from Exeter to network with Russian, Chinese and Kazakh colleagues working on questions of Eurasian integration and laid foundations for further joint research and collaboration. Posted in Events. Tagged BRI, China; Central Asia, Eurasia, Eurasian Economic Union, Integration, Kazakhstan, Kyrgyzstan, Russia.